Salivary gland cancer (SGC) is a rare and heterogeneous disease with significant differences in recurrence and metastasis characteristics. As yet, little is known about the mechanisms underlying the initiation and/or progression of these diverse tumors. In recent years, the AAA+ ATPase family members Pontin (RuvBL1, Tip49a) and Reptin (RuvBL2, Tip49b) have been implicated in various processes, including transcription regulation, chromatin remodeling and DNA damage repair, that are frequently deregulated in cancer. The aim of this study was to assess the clinical and functional significance of Reptin and Pontin expression in SGC. Immunohistochemical staining of Pontin, Reptin, β-catenin, Cyclin D1, TP53 and MIB-1 was performed on a collection of 94 SGC tumor samples comprising 13 different histological subtypes using tissue microarrays. We found that Reptin and Pontin were expressed in the majority of SGC samples across all histological subtypes. Patients with a high Reptin expression showed a significantly inferior 5-year overall survival rate compared to patients with a low Reptin expression (47.7% versus 78.3%; p = 0.033), whereas no such difference was observed for Pontin. A high Reptin expression strongly correlated with a high expression of the proliferation marker MIB-1 (p = 0.003), the cell cycle regulator Cyclin D1 (p = 0.006), accumulation of TP53 as a surrogate p53 mutation marker (p = 0.042) and cytoplasmic β-catenin expression (p = 0.002). 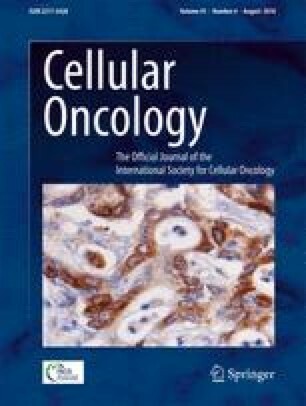 Increased Pontin expression was found to significantly correlate with both cytoplasmic and nuclear β-catenin expression (p = 0.037 and p = 0.018, respectively), which is indicative for its oncogenic function. Our results suggest a role of Reptin and Pontin in SGC tumor progression and/or patient survival. Therefore, SGC patients exhibiting a high Reptin expression may benefit from more aggressive therapeutic regimens. Future studies should clarify whether such patients may be considered for more radical surgery, extended adjuvant therapy and/or targeted therapy. We thank Inka Buchroth and Gabriele Naber for their expert technical support. The W.E.B. laboratory is supported by the Deutsche Forschungsgemeinschaft (DFG), grant DFG EXC 1003, Cells in Motion, Cluster of Excellence.